Software engineer Mike Caldwell shows the front (R) and back, hologram side, (L) of a physical Bitcoin he minted in his shop on April 26, 2013 in Sandy, Utah. SecondMarket, a New York-based investment platform that specializes in alternative ventures, Thursday began accepting investors in its Bitcoin Investment Trust, a private investment vehicle that will purchase the virtual currency, store it in a virtual safe of sorts and allot new shares of stock to shareholders as they buy in. The fund kicked off with seed investment of $2.25 million from SecondMarket, which specializes in alternative investments. Mark Murphy, a SecondMarket spokesman, said the fund had heard from financial professionals, technology figures, gold enthusiasts and others. "There's really high interest," said Murphy, who said there is no goal as far as the size of the fund. The fund's arrival comes as investors look for new ways to bet on the four-year old currency, increasingly used to make payments in online transactions. There is an estimated $1.5 billion in bitcoin on the market. Partisans of bitcoin say it offers promise as a global and easily transacted currency outside the purview of central bankers. SecondMarket designed the fund as a means for investors to bet on bitcoin without having to procure the currency themselves. "We believe that bitcoin may have significant upside given the size and scope of the industries that are potentially impacted by bitcoin," said SecondMarket founder Barry Silbert in a statement. "However, bitcoin also faces regulatory uncertainty and widespread adoption issues that make investing in bitcoin a highly risky endeavor." As a private fund, the venture is open to accredited investors, those who meet specific criteria such as, for an individual, earning at least $200,000 a year for the last two years. The minimum investment in the fund is $25,000. The fund is regulated by the US Securities and Exchange Commission, but is not registered with the agency, Murphy said. 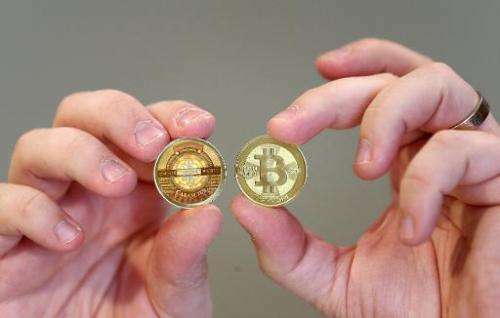 The fund's launch comes as some regulators have stepped up probes into use of the virtual currency. The New York Department of Financial Services in August sent subpoenas to leading investors in bitcoin and expressed concern that it could be used by drug traffickers and gun runners and threaten US national security. The department said it was considering new regulations on the currency. Bitcoin's dilemma: go mainstream, or stay radical? The problem of a currency like bitcoin where the size of the currency pool is limited, is that people start to hoard them which creates market bubbles, so the term "betting" is quite apt. You're basically collecting as much currency out of circulation as possible to inflate its apparent value, and then try to be among the first to sell before the price plummets to zero again. Of course the whole point of the currency is that the people who originally created them and mined all the easy coins have already exchanged theirs for something real, leaving everyone else to gamble with a currency that is almost useless as a real exchange medium because of its instability. Hoarding doesn't create market bubbles. Fiat currency, which lacks scarcity, does because it's legalized counterfeiting. Bitcoin isn't a finite resource it can be split into smaller sizes as demand increases. Those who hoard will lose out on interest they could make on loans the difference is that bitcoin doesn't PENALIZE those who keep it, unlike zionist funny money which loses value every second. unlike zionist funny money which loses value every second. Great, now you're blaming Jews for inflation. "The New York Department of Financial Services in August sent subpoenas to leading investors in bitcoin and expressed concern that it could be used by drug traffickers and gun runners and threaten US national security." The USA's greatest export? Military weapons. The USA's greatest import? Drugs both self prescribed and otherwise. The USA's financial market? A privately run bank, called "The Federal Reserve" with it's Ponzi scheme called "Fractional Reserve Lending" and the never ending interest scams - so the USA is in debt for trillions, on money that ever existed. So exactly what is their point? Hoarding doesn't create market bubbles. Hoarding creates market bubbles due to a very simple mechanism. As money gets hoarded away into bank accounts, the remaining money in the market gets divided into smaller and smaller pieces to account for all the goods that are being traded with the money. That means the value of the money increases in relation to the goods, which means saving it becomes profitable, which means more money is being hoarded and removed from the market. It's a positive feedback loop that ends with someone trying to cash in, which causes the value of the money to fall as more money enters the market and prices start to rise again, which causes others to try to sell their money for goods before it loses more value, which causes it to lose more value. Bitcoin cannot create market bubbles because hoarding is a DEFLATIONARY process. Deflation is exaclty what causes the bubble. The value of the money in other goods such as food and gasoline goes up sharply, and then comes down just as sharply in a repeating cycle. You're simply looking at it from the other perspective where prices of goods in some currency go up and down. Houses get more expensive because more money is injected into the system and so forth, but this is exactly a mirror image of a deflationary bubble. In a deflation bubble, it's the money that becomes more expensive and the prices that fall, and then suddenly rise in a hyperinflation as the people who invested in the currency let it loose. Furthermore, under deflation the prices and profits keep falling continuously, so you cannot do business because you can't pay yesterday's debts and wages with tomorrow's income. Moreover money in an account is not hoarded. It ought to be lent out to borrowers which stimulates the economy. But this is exactly how the current banking system creates more money - by lending out money that they don't own while still promising that the money is available to the original owner, effectively doubling the amount every time it's re-deposited and re-lended in a different bank. With a fixed amount of currency, simply putting it in your sock is more profitable than investing or lending it at reasonable rates, because any time you remove a bitcoin from the market, the rest of your bitcoins become that much more valuable as the market prices necessarily have to come down to account for the loss of one coin. Fixed amount of currency is the only kind of currency that makes sense. Because as a measure of value the aggregate of money is supposed to be compared to the goods exchanged on the market. Thus changing the global amount of currency in circulation is pretty much as silly as changing the length of a meter from times to times. As far as hoarding is concerned, it is not an issue at all, and it's just a pejorative term for "saving". The tendency for people to save money only reflects the preference for the future consumption against present consumption. It is a fundamental economical attitude. If people start hoarding, it will make the buying power of money higher, thus increasing the incentives for people to start buying and stop hoarding. It's a self correcting feedback, not unlike the offer-demand system, which tends to make prices correct themselves when they get high, as people start to make efforts producing stuff when they see the price get high. Fixed amount of currency is the only kind of currency that makes sense. Only if the economy stays a fixed size as well. As far as hoarding is concerned, it is not an issue at all, and it's just a pejorative term for "saving". Saving becomes hoarding when it's done for the purpose of reducing the free currency on the market to increase the worth of your own savings. Why would they buy today when their buying power will be more tomorrow, and even more the day after tomorrow? Deflation is just that: when the rate of value rise is faster than the interest you get from the market, making it more profitable to sit on your money than to invest it, which is a self-feeding cycle. It's a self correcting feedback, not unlike the offer-demand system, which tends to make prices correct themselves when they get high, as people start to make efforts producing stuff when they see the price get high. No such universal feedback mechanism actually exists, because deflation at the same time reduces profits on the market by lowering prices continuously, and increases profits on savings the more money you put away. It other words, it discourages spending and encourages saving, until saving turns to hoarding, and hoarding turns to a rapid inflation cycle as people start spending the money they've amassed and see that it's quickly losing value the faster the more they spend. Small amounts of deflation may correct itself by increased spending, but it's a highly volatile system that trips into oscillations the moment that something abruptly changes the amount of money on the market, triggering either a rush to grab money, or a rush to buy things.